You should know the name Satoshi Kon. Well-known for his films Millennium Actress, Perfect Blue, Tokyo Godfathers, and Paprika, the "Hitchcock of anime" decided after his first three movies that he had more ideas to play with, so what did he do? He dumped all his unused stories into a 13-episode mini-series that does to society what a starfish does to a fiddler crab. Look it up on Wikipedia  it’s awesome! 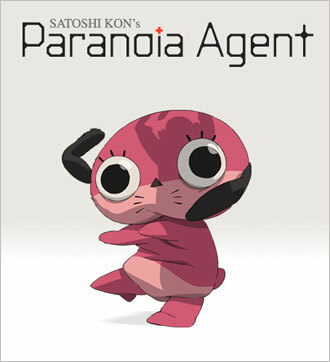 And Paranoia Agent isn’t that bad, either. The surrealist psychological drama centers upon the mystery of Shonen Bat (‘Lil Slugger in the English version), a mysterious young boy terrorizing emotionally cornered citizens with a bent, golden baseball bat. Ah, little league tee-ball; those were the days. The detectives who act as the loose story's main characters have no leads and each victim leads only to more dead ends as the murky legend of Shonen Bat reaches mythic, nearly supernatural proportions. And the strangest part of these attacks? The victims lose their worldly troubles; their head traumas somehow make them happier. Not very hard for the average Japanese cram school student, let me tell you. So just when you start to fear Shonen Bat, you start to respect him...then go right back into being terrified, like a circus clown with a flamethrower. Kon roped in Seishi Manakami for the script. His goal was to shift perspectives by changing the main character in each episode, giving viewers a macrocosm of Shonen Bat’s influence. Each character gives a very personal POV into their individual case, personal struggle, and eventual encounter with Shonen Bat. Some episodes can be watched on their own as their characters have little relevance to the larger story. Such episodes are magnificent fillers, but Kon’s fingerprints are all over each of them. His grasp of human emotion, psychology and story structure are frighteningly accurate, which makes the black humor in Paranoia Agent even funnier and more poignant. If you laughed at Heath Leger in The Dark Knight, you’ll get a few sick chuckles out of episode eight. What draws me to Paranoia Agent, from the old-fashioned detective to the reserved animator to the schizophrenic tutor to the fallen golden child to the lecherous reporter, was the pathos developed with every character. Every character is a case study for the psychological pressures of modern Japan. The situations are very believable and the stress of Tokyo almost becomes its own character as students, teachers, and the elderly are all equally pressed from all sides by the struggle to match society’s expectations. As a testament to Satoshi Kon’s micromanagement prowess as a director, every episode features a repetitive sound that sets the pace and structure for the story. Speaking of sound, the bizarre pseudo-techno, dreamlike music of Susumu Hirasawa (Paprika, Berserk, and Millennium Actress) adds another level to this visual mind-screw into a scrambled but beautiful mess, like a naked rugby game during a hurricane. During his interview on the first DVD, Kon mentioned his fascination over a child’s ability to create a stomachache just to avoid going to school. Thematically, avoiding responsibility is the social and emotional paralysis that summons Shonen Bat. If you watch this series and keep “accountability” in mind, you will understand every symbolic shot in this series. Now Paranoia Agent is obviously not for little kids, but this masterwork deserves at least a gander from any fan of Hitchcock, Memento, or Misery. For the ridiculously low price you can find it for, it deserves a spot on your shelf. (The English dub is unmatched in its execution to boot!) It is exciting, dangerous, and visually dazzling stories like this that keep me watching anime.